4 Copas Reposado is our rested tequila and is aged for a minimum of 60 days in white oak barrels. The barrels give the Reposado a golden color and it also softens its taste by imbuing it with a light wooden accent. During the aging phase, the lighting, temperature and moisture conditions inside the warehouse are strictly controlled and monitored in order to produce this premium, authentic tequila. Bright and golden reposado, medium body with a rested and balanced nose full of butter and cinnamon, and hints of wood and orange. Mildly sweet and citrus initial taste with quick alcohol burst, and a medium finish with spice and wood. Excellent hand blown colored bottle adorned with the artwork of artist Joel Rendon of Mexico. Great distillery. Some of my favorite tequilas are made there. It's a brand that's beloved by tequila lovers and often lauded. Aroma: Agave, oak and a hint of earth. Initial Taste: Nice and sweet agave with a hint of caramel. Very pleasant. Body: Medium body and semi-oily mouth feel. Nice compliments of oak and caramel to the agave. Mostly sweet...not bitterness or burn. Almost buttery. Finish: Short and light finish. Lots of agave, oak and vanilla flavors with only a hint of spice. Nice...but nothing special. This is a very good overall tequila. It lacks some of the spice that I want in a reposado, but the flavors are complex and very tasty. I've seen this as low as $30 and as high as $60. That's a huge range, but in the $30-40 range this is a great buy. 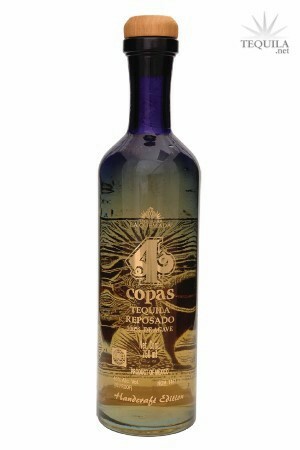 4 Copas is a very approachable tequila yet exhibits a lot of complexities that experience tequila drinkers will enjoy. Aroma: Agave, wood, earth, and roasted nuts. Initial taste: Surprisingly sweet, smooth. Body: Complex with flavors of wood, vanilla, agave, and dry grass. Finish: The sweetness just keeps going. Very smooth, if a bit anticlimactic. I find that this tequila doesn't finish with an "oomph", but rather begs you to drink more to remind yourself of the flavors you experienced while it was in your mouth. I'd like to see the agave sweetness balanced a bit more with the dryness of the wood. Overall, I think this tequila is really good. I'd love to keep a bottle around all the time. But at $50, I think it's fair to say that there are other reposados that have better value (Siete Leguas being the first that comes to mind). If I ever find it on sale though, all bets are off! Taste out of a snifter on 11/23/08. 4 Copas reposado is an excellent reposado, the whole 4 Copas line is just beautiful. Usually reposados are the least favorite of mine. But when it comes to this one, that opinion goes to the dogs! I highly recommend this one for new tequila drinkers, it will welcome them with open arms. Aroma: A very subtle yet present nose of lemongrass and wood. Initial Taste: A semi oily mouth feel, upon entry it's nice and sweet with no bitterness and an initial taste of caramel. Body: A warm and beautifully complex body of agave, complimented by wood, caramel, and citrus. Finish: An ever so lightly heated finish of long duration, with a lingering aftertaste of agave and caramel. One of the best finishes I ever experienced. 4 Copas gets it right, yet again, with their reposado. The nose is not overpowering, but smells of cooked agave and also contains a mild floral sweetness with hints of cinnamon and clove. The initial taste yields more agave with mild to moderate oakiness - nice in a repo. 4 Copas reposado is light in the mouth. The finish is sweet and smooth with a medium-long duration of flavor. Right now, I feel the domestic reposado market is fairly weak and so any good reposado really stands out. 4 Copas is certainly one of my absolute favorites and I highly recommend it to both blanco and aged tequila lovers. 4 Copas Reposado NOM 1457 Tasted 3/5/07. The tequila is a yellow golden color with intense floral and earthy aromas. A soft mellow entry leads to a sweet taste, with low bitterness and moderate-to-heavy agave flavor. While there is moderate-to-heavy agave flavor, the tequila has moderate earthy and floral flavors with mild fruit, caramel, and smoke. The tequila finishes with a long duration of flavor and a numbing alcohol finish. Overall, I gave the tequila an A-.